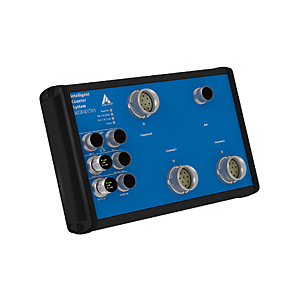 The Ethernet sin-/cos counter system MSX-E1741-1VPP has 3 sin/cos counter inputs 1 Vpp, 1 analog input, 24-bit, and a fast 24 V digital trigger input. The system was especially developed for the acquisition of sensor- and actuator data close to the sensor in the harsh industrial environment and has a robust normed metal housing with the degree of protection IP 65. It has an extended temperature range from -40°C to +85°C. The ARM®9 32-bit processor allows the calculation of the acquired values. The Development Mode allows to customise applications individually. Through synchro connection, several MSX-E systems can be cascaed and synchronised with one another in the µs range. The ConfigTools program (included in delivery) allows an easy administration of the MSX-E systems. These are automatically detected in the network. 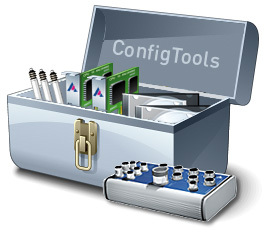 ConfigTools consists of common and specific functions. In addition, with ConfigTools, the complete configuration of a MSX-E system can be saved and transferred to another system of the same type (clone function).